Bluegills have small mouths and an oval shaped body deep and highly compressed. The fish is olive green on the upper body and light yellow on its belly. Blue and purple iridescence on cheek. Dark bands run up and down from the back fading into the belly. A dark blue or black "ear" on an extension of the gill cover. Inshore from the Great Lakes to Florida. In all tributaries of the Chesapeake Bay with salinity less than 18 ppt. Bluegills are a freshwater fish, although they will venture into slightly salty water. Spawning takes place from April to September in fresh water. The male picks a good spot and makes a nest. After the female lays her eggs, the male guards the eggs and newly hatched young. Earthworms or even corn kernels make good bait. 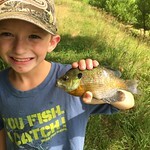 Easy to catch, bluegills make a good pan fish. Bluegills are a member of the sunfish family. For more information on bluegill and their management, please contact Brett Coakley.